The unconscious is unknown to us all; it lives and reigns without our knowledge. It is full of desires, great and small, that demand gratification at any cost. As a result, it may expose itself and the subject to difficulties and even dangers. To achieve its goals, the unconscious follows paths that are straight and crooked; it meets obstacles that are foreseeable and unforeseeable, surmountable and insurmountable. 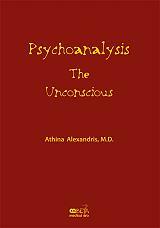 In the present study the Psychiatrist/Psychoanalyst Dr. Athina Alexandris tries to present the unconscious of children, adolescents and adults on the individual and group level by discussing some of the cases she has dealt with during her many years of clinical experience. An attempt was made to explore the unconscious of children who are seriously psychologically ill, their families and the professional personnel involved. In addition, the unconscious communication between a mother and her little daughter is presented and vice-versa, in the paper entitled ''The phenomenon of the reported dream''. Finally, the unconscious two-way link is studied between transference and counter-transference. It is certain that this study of the unconscious will contribute to the knowledge and understanding of the unconscious that are required by other professionals as well as ordinary people.